Seeon Meetings - vwfbs Webseite! The Priority Research Grant of the German Research Council (DFG) ”Angiogenesis” (SPP 1069) has inaugurated the International Kloster Seeon Meeting series “Angiogenesis” with meetings starting in fall 2000 and continuing every 2nd year. These meetings are known for their scientific intensity and atmosphere of informal exchange in a unique setting of a monastery close to the Bavarian Alps. Encouraged by the success of these Kloster Seeon meetings and feedback from the community, scientists from the new SPP1190 "The tumor - vessel interface" have taken the initiative to launch a new Kloster Seeon meeting series entitled “The tumor - vessel interface: Cellular and molecular mechanisms of tumor progression and metastasis”. Alternating with the angiogenesis meeting series, this meeting series was hosted biannually from 2007 until 2011. The first meeting of this series has been held in September 2007 - Aimed at bridging the fields of vascular biology and tumor biology to explore novel avenues in tumor progression and metastasis research, this meeting is not just intended to provide a discussion platform for the exchange of the latest findings in the field, but rather to stimulate an atmosphere that can breed new ideas and collaborations. In 2014 the International Kloster Seeon Meeting “Mouse Models of Human Cancer” was initiated by the Helmholtz Alliance Preclinical Comprehensive Cancer Center – PCCC. The PCCC was a consortium of 20 outstanding scientists in cancer biology. The alliance was aimed at the development and exploitation of advanced tumor mouse models which better mimic the human situation to push the overcoming of the gap between basic and translational research. The meeting was repeated in course of the Helmholtz Alliance in 2016. The biannual Kloster Seeon Meeting series “Angiogenesis” has earned a strong reputation as the premier European Angiogenesis meeting. The organizers have committed themselves to host a highest caliber meeting of utmost intensity in the spirit of the previous Seeon meetings. This includes coverage of the most recent and timely developments in angiogenesis including the field of tumor progression and metastasis research. Investigators will present their latest results and discuss new challenges and methods. The Seeon Angiogenesis meetings alternate in even years with the Newport Angiogenesis Gordon research conferences, which are held in odd years. Thus, the scope and format of the Seeon meetings is similar to the GRC limiting participation to 115 persons, which are recruited as invited speakers, representatives from corporate sponsors, or selected on the basis of submitted abstracts. We intend to bring together some of the key players in the field of angiogenesis research in order to transform the Seeon Monastery for three days into an intense angiogenesis think-tank. Clearly, we do not just want to provide a discussion platform for the exchange of the latest findings in the field, but rather stimulate an atmosphere that can breed new ideas and collaborations. Moreover, the organizers intend to give young talented scientist the opportunity to exchange and discuss their findings with experienced scientists in the field and to provide the opportunity to take their next step into their scientific career. 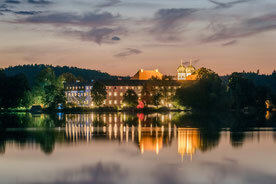 Most importantly, the exclusive atmosphere and high quality of the Kloster Seeon Meeting series originates not only from the unique location, but primarily from the excellent expertise of the invited speakers.